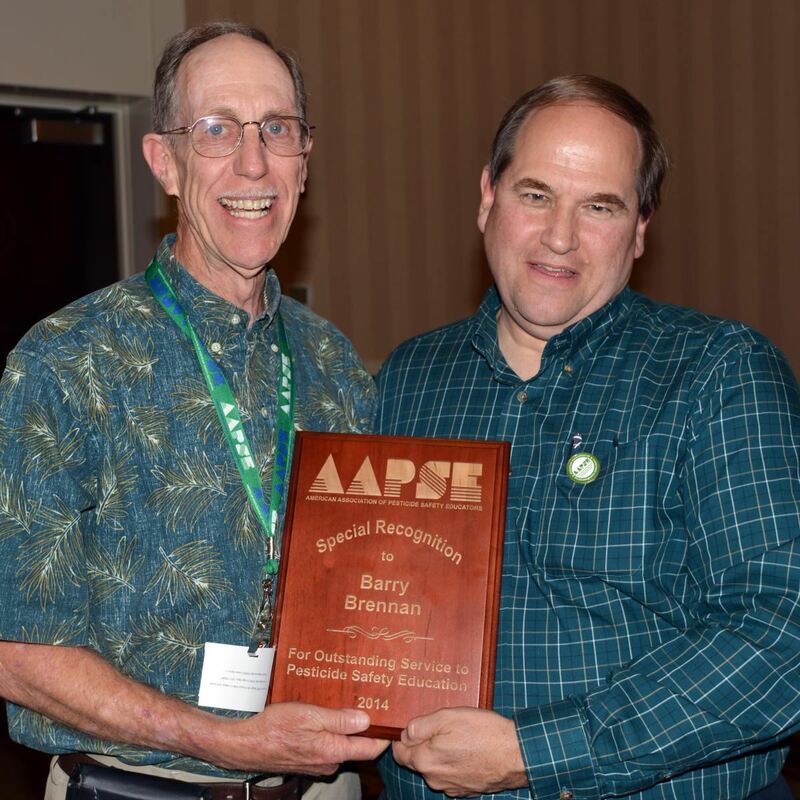 Life Member - Barry Brennan, Ph.D.
Barry Brennan (left) with AAPSE President Mike Weaver at 2014 AAPSE National Workshop in Harrisburg, PA. Barry was awarded special recognition for his years of service to AAPSE including his recent service as JPSE Associate Editor. Associate Editor of JPSE (2009-14). Described by many as the "father of AAPSE" -- Barry Brennan was one of the early founders of AAPSE. He was the catalyst that started the organization. He along with his colleagues started the discussion in 1991. That year a charter was drafted to establish the precursor to AAPSE -- the National Association of Pesticide Educators (NAPE). AAPSE became a reality officially in 1993 - members signed the second charter in a New Orleans PACT workshop. Had it not been for Barry the organization might not have existed. He also was instrumental with Mike Weaver for the idea of AAPSE hosting an academic journal. The Journal of Pesticide Safety Education (JPSE) was started in 1999. Barry served in multiple leadership roles including President. Barry's leadership will forever be known as a significant contribution to pesticide safety education. He led the University of Hawaii program for years. In the 1990s he spent time as USDA-CSRS Extension program leader in pesticide safety -- servicing in Washington, DC for several years. His connections there helped AAPSE and his colleagues. Barry was an excellent ambassador for the program. Barry also spent years in the Army Reserves. He was an amazing colleague and friend to all who knew him. Barry Brennan was the University of Hawaii’s Pesticide Coordinator and the Pesticide Applicator Training Coordinator from 1976 until 2001, when he was appointed Associate Dean and Associate Director for Cooperative Extension. He was the co-PI (along with Lee Yudin) for the 1994 train-the-trainer project. From 2003 to 2006 Brennan served on both the Western Region IPM Centers Steering and Advisory committees. He was responsible for obtaining funding from Tropical Subtropical Agriculture Research (T-STAR) program to conduct Pest Management Strategic Plans (banana, papaya, coffee) and crop profiles (banana, taro, coffee, pineapple, watercress) for several crops grown in the Pacific. In 2001, Brennan was the PI for a Western Region IPM Center grant (American Pacific Pest Management Information Program). Pest management issues are often unique to this region because of crops, cropping systems, environmental conditions, and pests. Regulatory decisions affecting crop production practices can have a major impact on ultra-minor crop production as is found in the Pacific. The American Pacific Pest Management Information Network (the Network) allowed stakeholders to respond to federal regulations that affect use and usage of pesticides. Barry is now enjoying his retirement in Hawaii and Arizona.